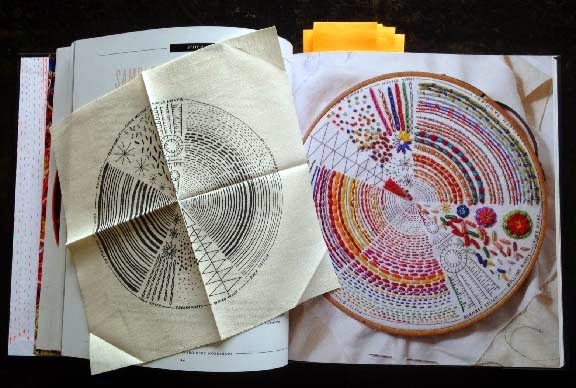 Getting Stitched on the Farm: Crazy Clouds + Rebecca Ringquist's Embroidery Workshop - A New Book + A Giveaway! 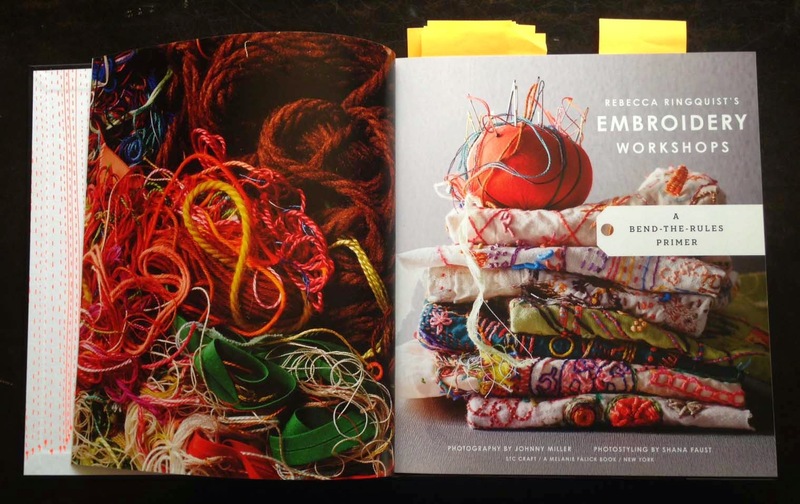 Crazy Clouds + Rebecca Ringquist's Embroidery Workshop - A New Book + A Giveaway! Tomorrow is the first of my Getting Stitched on the Farm Creative Retreats here at our farm. 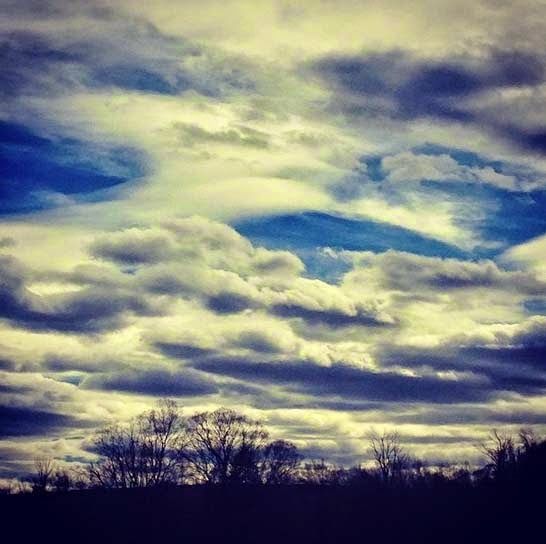 I am busy getting ready but wanted to pop in today to share a gorgeous photo of the clouds the other day. It has been a beautiful week weatherwise and the clouds have been crazily gorgeous. I'll be back next week with photos from the class. I have a great post today for you all with a giveaway opportunity! 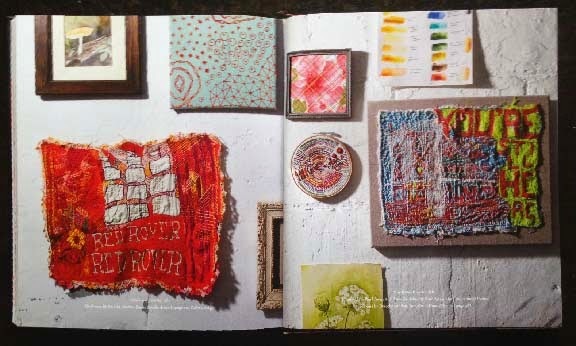 I have been waiting for the new book from Embroidery Artist/Teacher/Designer Rebecca Ringquist to be released. Aptly titled Rebecca Ringquist's Embroidery Workshops: A Bend-The-Rulers Primer, it has just been published by STC/Melanie Falick Books. Rebecca teaches embroidery at workshops throughout the US and on-line. She has a Fine Art background and has used those skills to create her own unique style of embroidery which includes both hand and sewing machine stitches. You can see her embroidered artwork here. 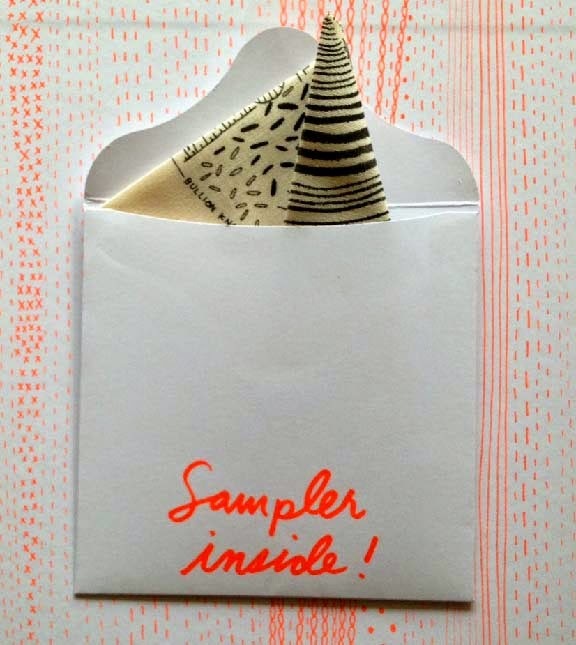 Rebecca is also the designer and driving force behind the "Dropcloth Embroidery Samplers" that are available through her Etsy Shop here. Rebecca is a couple of decades younger than me and because of that, I think her style speaks to a younger generation of embroiderers. Or perhaps I should say - stitchers who are a little more experimental than representational - after all embroidery should have no ageism. It reminds me of a more "fiberart" approach to embroidery. When I was in Grad School, I had a professor named Tom Lundberg who was pushing the limits of embroidery and Rebecca's work does too. RR's Embroidery Workshops begins with the basics - types of threads, needles, fabrics, hoops, thimbles, transfer supplies to use and finishing materals. Rebecca introduces the reader to using printed and vintage fabrics and ribbons as base fabrics to stitch upon. The first How-To Chapter (after the lovely Introduction) is called Stitch and in it she introduces her favorite stitches - running, backstitch, couching, French knots, bullion knots, blanket, satin, chain, spider web and woven picots. The second part of the chapter explains how to use a basic sewing machine for decorative embroidery. Rebecca does not use a fancy embroidery machine, just a simple zigzag type machine - therefore making her work accessible to more stitchers. This chapter finishes up with a Sampler project of the stitches. The remainder of the chapters are called Trace, Draw, Layer, and Finish. Some projects from those chapters are shown below. 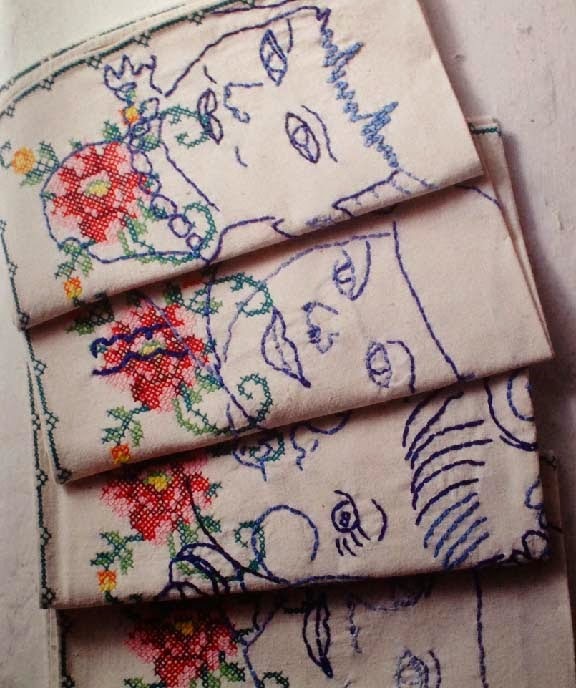 This first project is called Portrait Napkins. Rebecca used a base of a vintage cross stitch piece, then traced a face from a coloring book and embroidered the lines. 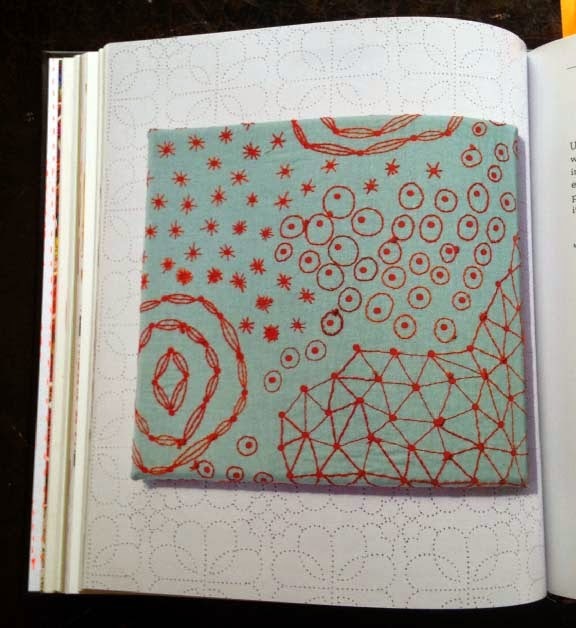 The Draw Chapter includes this Polka Dot project using the dots on the fabric as a base. 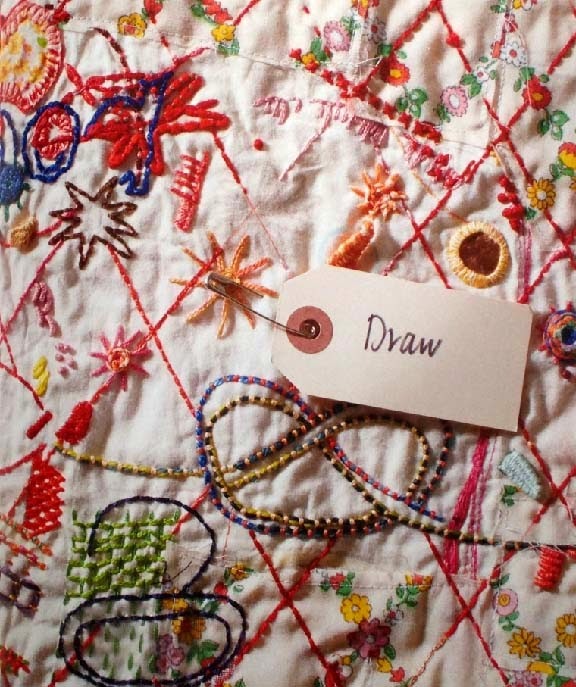 The dots are embellished with her hand-drawn doodles that are then stitched upon. It gives a modern look to embroidery. The Draw Chapter also includes DIY instructions to teach the reader how to have the confidence to draw themselves - through doodling, line drawing with a ruler, and drawing from nature. That is an awesome addition because I find so many new stitchers are intimidated to draw. Hopefully Rebecca's encouraging words will get them over their fears. 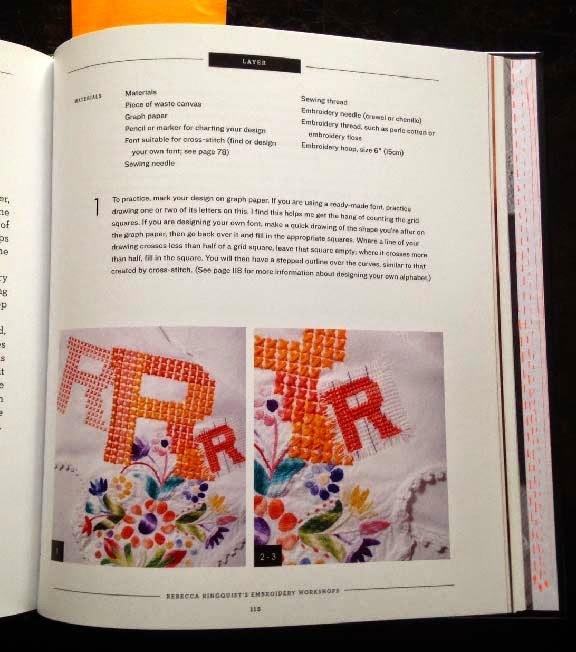 The Layer chapter includes instruction for adding cross stitch embroidery onto vintage pieces with waste canvas as shown below. These embroidered brooches are made from belt buckles with the embroidery done on re-purposed vintage embroideries. 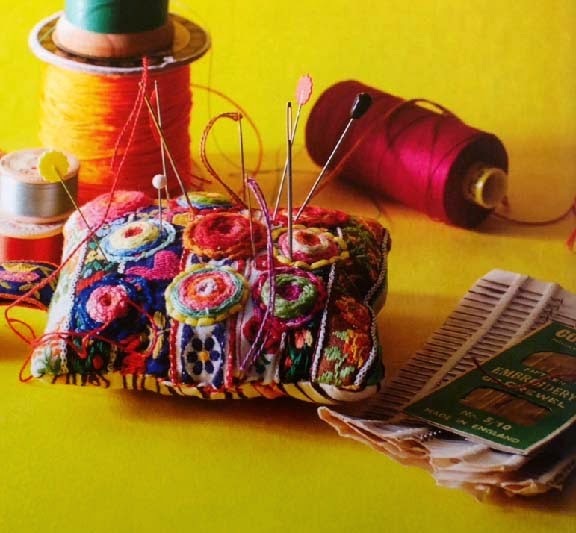 This colorful pincushion was made by sewing together ribbons and then embroidering spider webs on top of them. There is so much more in RR's Embroidery Workshop. It is beautifully photographed by Johnny Miller. The colors and the tactile quality of the styling and the brightly colored backdrops used in the photos really appeal to my inner colorist. I hope you will look for it soon. 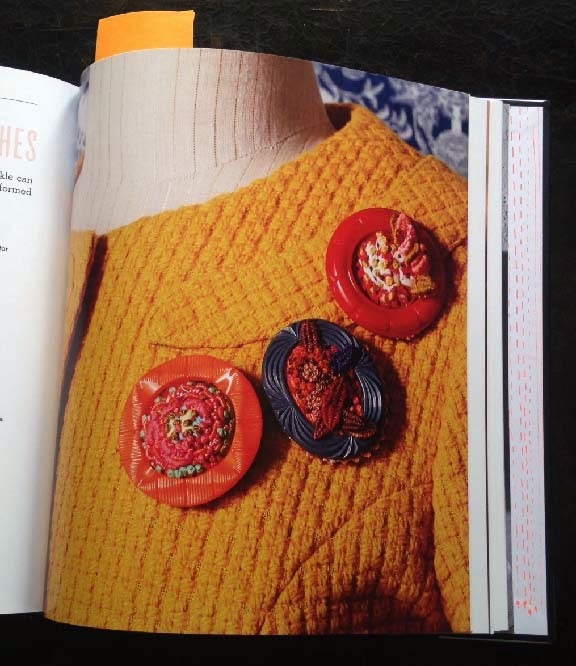 Perhaps it is just the book to inspire you to pick up a needle and thread in the upcoming summer months. 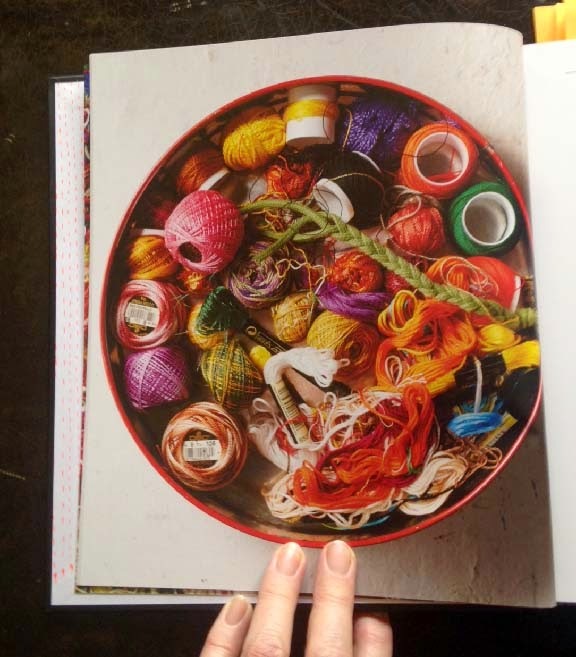 I am so psyched that this book was published because I think it will bring more stitchers into the creative hobby I love so much. Check out Rebecca's Dropcloth shop here. Thanks to STC/Melanie Falick Books for contributing the winner's copy (and my review copy) of Rebecca Ringquist's Embroidery Studio. You can listen to a Podcast Interview with Rebecca Here on Abby Glassenberg's podcast While She Naps. You can listen to a Podcast Interview with Rebecca Here on Jennifer Ackerman's podcast Craft Sanity. 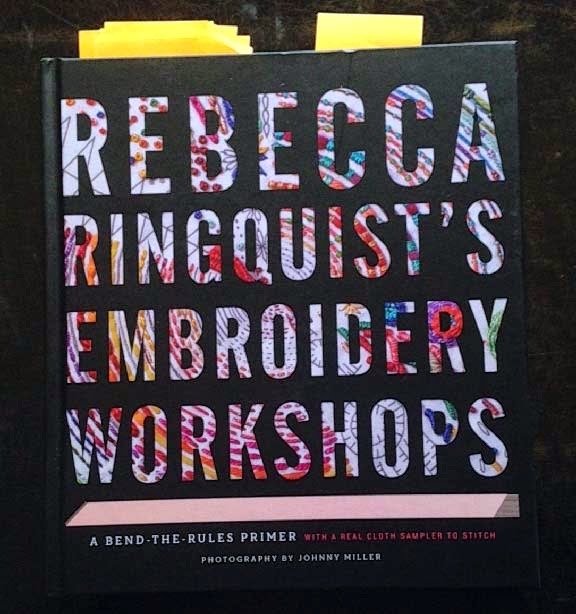 Here's what I have for you all today ---- a chance to win your very own copy of Rebecca Ringquist's Embroidery Studio. Tell me what your upcoming summer artistic plans are. Are you going on a Retreat to learn something new? Are you going to take an on-line class? Or are you going to teach yourself from a book? AND what art/craft will you be working on? U.S. Residents Only. Contest ends Monday May 4th at 11:59 p.m.
AS ALWAYS - LEAVE AN EASY WAY TO GET A HOLD OF YOU. Good luck everyone. I'll be back next week with photos of our Creative Retreat here at the farm. Hi Kristin! I'm going to design and build a garden! I've lived in my house 20 years with just a rectangular lawn, and now is the time. There will be beautiful colors, shapes, textures and spaces when I'm done. No retreats in my future but I am drawing my first embroidery pillow. I did your cat in a chair and since I have two cats thought I would design one in a rocking chair to go along with the other. I'm taking your online class and looking forward to learning a lot more! I just started a new embroidery project last night! I think I'll do more embroidery and less knitting this summer. I've admired the Dropcloth Embroidery Samplers on etsy and would love to own this book. Thanks very much! I'm so excited to be going to spring Squam again, in just a few weeks. I took a workshop with Rebecca there are few years ago and I had a great time. I always come back from Squam with a headful of new ideas and new motivations, so who know what I'll end up doing after that! I have a Sublime Stitching book I plan to work from and also I recently bought some new coloring books and colored pencils (Charlie Harper, yay!) and plan to color out my stress. Thanks and I hope you have a fantastic weekend! I am working on publishing a line of knitting designs. And hopefully will do some gardening. Would LOVE to get back into embroidery. I am heading to Vermont for a crafting getaway and just learned to spin on a spinning wheel. My first love has always been embroidery although I see the spinning becoming an addiction. I want to work on some glass etching projects! I usually do most of my artistic work in the fall and winter when we have the longer evenings and more time to myself. We just bought a new house and I have plenty of gardens so this summer my focus is going to be a beautiful kitchen herb garden (I've always wanted one!!!) and making many things with my herbs. Taking a cheese making class soon so cheese with herbs ... is that artistic??? "Tell me what your upcoming summer artistic plans ": Spinning Yarn and working on my knitting, crochet, needlepoint and embroidery. " Are you going on a Retreat to learn something new? ": Going to The Black Sheep Gathering in Oregon and a few other local Northern California fiber events. "Are you going to take an on-line class? ": Currently taking quite a few Art History and Textile classes thru my local colleges. Every Day is a Fiber Art Day! 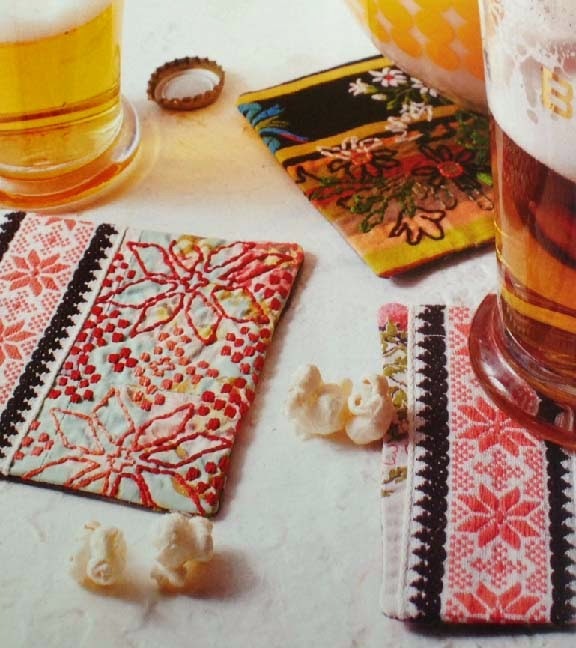 I have been looking at sashiko stitching for so long now. I am definitely going to try this very soon. It,s beautiful. I have been in a bit of a creative slump so I plan to look at all my craft books and try something new. My summer plans are mostly for my outdoor spaces: a new flower bed, a bottle tree, and some kind of fairy house. My summer plans include the spending time in my little back yard enjoying the perennial garden I started last year, a week at a nearby lake cottage, and learning to crewel embroider!! I bought your circle pillow kit and have been watching the online tutorial you have. Almost ready to start the project! I'm also hoping to stop by the Northampton Farmers Market to meet you in person and say Hi and thanks!! I plan to do lots of knitting as always and want to work on some small quilts for table runners and wall hangings. 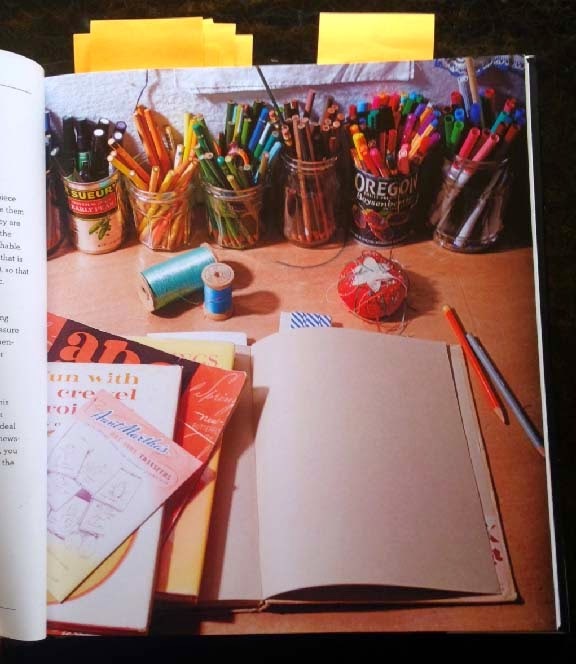 I'd be curious to try the projects in this lovely book! Thanks for the giveaway! I'll be knitting a baby blanket for a nephew this summer. Seeing your blog today has me itching to do some stitching. I'm going to try to spin on a drop spindle. I purchased one with some fiber but I've been a little afraid to try it. I've just recently retired so I have plenty of time. That's what my summer plan is. Hi Kristin! I am going to work on a quilted portrait of my. Dog using books to learn and hoping to use embroidery as part of the process. ~ Thank you for the fantastic preview of Rebecca's book. So inspiring!! My Summer plans are to plant new areas for herbs & flowers and create Fairy Gardens. I'm designing knitted dolls, with nature themes, and also dreaming of painting several areas of my house that I've wanted to for many moons. I am using lots of embroidery on my knits, with felted work too, learning and enjoying inspirations from books, books, books! ~ oops, forgot to leave email with above comment. I would love to knit at least two sweaters with yarn I bought at fiber festivals this year. I am hosting a knit along with my knitting group and we are planning on knitting The Waterlily, a tshirt shaped pullover with a lace yoke. . Other than that daily hikes on the mountain with the dogs, camera in hand. I have looked and looked again at your Craftsy embroidery classes. In order to give myself a push on starting I took two classes at Knack in Easthampton this winter/spring that were presented by Bonnie Sennot. After scouring on-line sources I've found some designs I want to try and am going to start today as a matter of fact. My goal is to embellish some plain t-shirts (my usual summer wardrobe) so they're actually pretty. I'm such a chicken about starting things like this..
Oh my! This looks like another beautiful book. I'm not an embroiderer although I have several of Helen M. Stevens's books, thinking that some day I might get the courage to get started. This book just might be the impetus to get me going. AND, I've even got floss, handed down from my mom. Otherwise, it's back to knitting and beadwork when I can find the time between farm work and gardening. I've never been to a retreat - learn mostly from books and magazines and some Craftsy classes. Thanks, Kristin for your generosity and inspiration. This Spring and Summer are dedicated to Drawing both on-line classes and books are my learning tools. I've learned to much about from Rebecca earlier this year and have several of her samplers now in progress. Embroidery is terrific and is freeing. Rebecca is certainly a large influence. I do believe both my drawing and embroidery go hand-in-hand. I am going to attend the TKGA conference which is in San Diego this year. I live in north San Diego county so I am excited I don't have to travel. 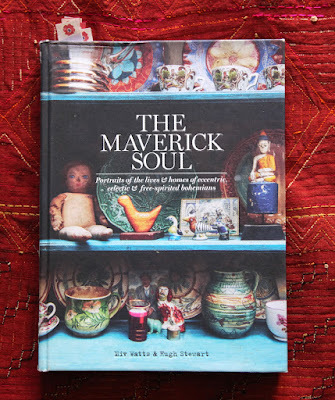 I have high aspirations for summer creativity- from getting back to canning in small quantities, to refinishing a table, knitting a warm Icelandic sweater and some crewel work. I am planning a week long vacation to just be home and make a mess! The most prominent of the artistic plans on my agenda is my first trip to Knitting Camp! :D All my life I've been only 4 hours from Marshfield, WI, including visiting Marshfield every single year to celebrate Thanksgiving with my dad's brother and his family, and I didn't even know such a treasure existed. I'm most excited about the chance to further explore my overall 2014-15 knitting goal: to learn to do and then explore colorwork. Another great review! I agree that this could be a very inspiring book and one to help give one courage to just try things new! This summer I am actually enrolled in a beginning spinning class and hope to purchase a spinning wheel before the year is out. But that's not all! Weaving, particularly with a rigid heddle loom, has caught my imagination. I hope to try that with the bulk of my instruction coming from online and print sources. There are so many talented fiber artists like yourself who are generous with your creativity and inspirations online. Thank you! Thanks for the opportunity to win this beautiful book! I've enjoyed Rebecca's classes on Creativebug. I've planned a getaway to the mountains with knitting friends in June. We're staying at a beautiful old hotel, and will enjoy each others' company while knitting all weekend. We might also plan a knit-along to work on that weekend. More and more of my recent Pinterest obsession is decorative needlework, and last week I actually bought embroidery thread for the first time in 20 years! Freehand threadwork can be so beautiful, so that's what I'll be concentrating on this summer. My learning plans for the summer are mostly from books and online. In September I am hoping to attend a knitting retreat if I can get a spot once it is announced! Thanks for the chance to win a copy of this book! It is a beautiful book! First of all, I want to say I loved your picture of the clouds. Clouds are one of my most favorite things to photograph and have tons of them that I like to just look at over and over again. They are always changing and always beautiful! The first weekend in June I will be joining about 28 other knitters in Madison, WI, for the first IBK Retreat with Susan B. Anderson involved all weekend. She will have a class on her new dolls for all of us to learn the intricacies of making them. There are other fun activities involved, but best of all getting to meet knitting friends from all over the USA and one coming from Norway! I have embroidered since a child and throughout my life, but had gotten away from it and recently have had a yen to return to that form of creativity. I have your new book and would LOVE to have this one, too, to encourage my creativity in a different form of embroidery. Knitting is always close at hand. In the summer, I try to get a head start on Christmas gifts with some smaller projects. Your enthusiasm for embroidery is tempting me , however. I would like to make some embroidered sachets to stuff with lavender when harvest time comes along. Thanks for sharing so many of your creative ideas with your readers. My artistic plans this summer are to make my home attractive enough to attract a buyer! LOL! But when my legs and energy give out, I am knitting socks, crocheting a bunny and sewing some knot bags for my sock knitting projects. I am taking several Craftsy classes as there is nothing within 3 hours of me and I have been self-taught from day 1..lol! I've always turned to books and I am placing an order today for one of yours and I am presently knitting socks with your self-patterning yarn which is MAGIC! I found out about you and your yarn by reading Susan B. Anderson's blog archives. (I do that a lot when I find a blogger I love!) I'll be reading yours too....they're like reading a good book! I dabble in everything and really started crafting years ago (40 or more) to decorate my home and learned different crafts along the way. Thank you for the drawing! I am slicher@centurytel.net just in case I win or Saminar on Ravelry. Love the clouds! Summer artistic plans . . . embroidery - I was just looking at an online class by Rebecca but her book would be great, too. 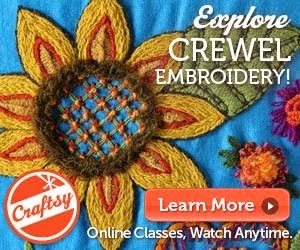 Also have your class on Craftsy! Knitting - lots of smaller projects in mind like felted clogs, mittens, felted zipper bags, pen cozies (LOVE these! ), maybe socks. Weaving - never really done it but want to learn. Making books - I've made a few and really want to make more. No retreat for me but I love learning from books and am learning to like on-line classes, too. I enjoy Creativebug's classes. I'm going for a weeklong Batik workshop at Siever's school of fiber arts on Washington Island, Wisconsin. Mary Jo Scandin is the teacher. This will be, I think, my sixth class with her. So much fun and very productive. I can hardly wait for July. I JUST took a modern calligraphy class a photography class AND a silk screening class. My pursuits are many.I think my most immediate project is rebuilding a stone wall on my property. I've never done it before but what the heck! I took a embroidery workshop last year at Squam Retreat and I really enjoyed it. I have been visiting your blog a lot recently and have been contaplating signing up for one of your workshops, I have been working on som samples from Rebecca's Shop, and doing embroidery on baby onesies.I am a definit want to be embroiderist. Please consider me for this wonderful giveaway. Inspired by your crewel work, my summer project is to turn linen sheets and wool blankets into pillows, table runners, tea cozies, etc for my very modern children. The linens were brought to America from England by my war bride mother. I think Rebecca's book may have some ideas I can use. Two friends and I hope to get together and learn to dye yarn. But also, you and other sites are drawing me to the embroidery side! That I would do on my own. This summer I will be doing a lot if quilting (lots of friends getting married and having babies) and knitting. I love to see embroidery making a comeback. I learned embroidery in a Structural Enrichment class at the Univeristy of Wisconsin while I was studying Textile & Apparel design. I loved embroidery and was pretty good at it, but have moved toward knitting. I think it would be fun to work on one of these embroidery samplers on my lunch break! So, first I plan to finish my scrap yarn afghan from your Crafting a Colorful Home book. Then, I'll try to finish that pair of socks I started a couple of years ago!